Moonlighter is a simple, beautiful game that totally deconstructs the dungeon crawler genre. You know when you see those fancy restaurants menus that talk about deconstructed food, where they’ve separated and highlighted all the base components of the food for you to enjoy? Moonlighter does that for its genre, with a style to boot. The dungeon crawler genre, as I’m sure you’re aware, is all about exploring, fighting enemies and most importantly finding loot to upgrade your equipment or to be sold. 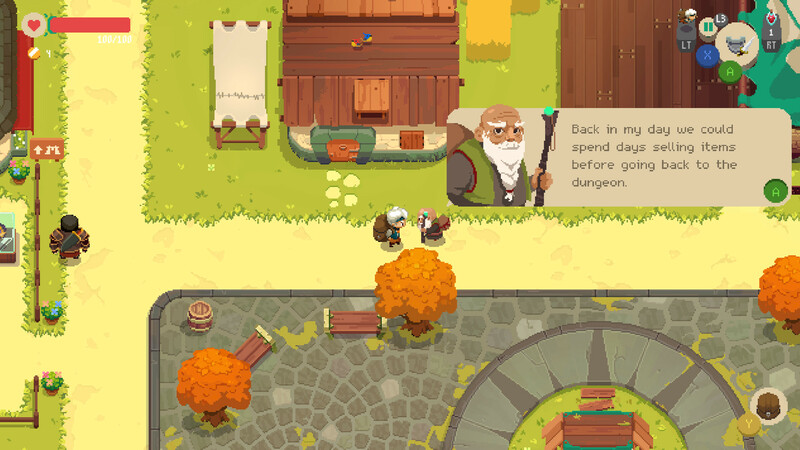 Moonlighter removes the middle man and has you as both adventurer and shopkeeper. By night you explore a procedurally generated dungeon for loot, and by day you sell it in your humble store. With the money you make from the loot you collect and sell, you can invest in the town, creating new shops to buy equipment. With the better equipment, you can delve deeper into the dungeons at night and get better loot to sell to get better stuff to delve deeper. 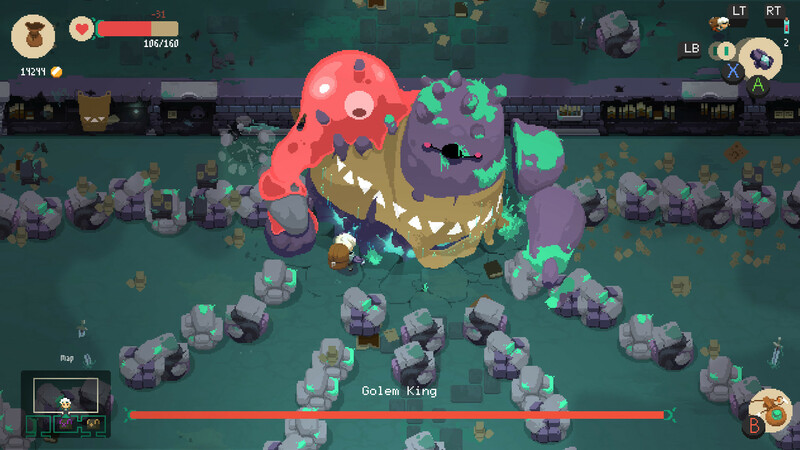 It might sound repetitive, but that is a staple of Dungeon Crawlers and Moonlighter nails it. Going on to quickly capture some video for this review led to me playing for nearly two hours. That’s because Moonlighter is essentially a collection of minigames that feed into each other. As well as that, and perhaps more importantly, each of these games has their own goals which feel constantly rewarding. As you crawl through the dungeon you’ll want to go deeper, fighting and conquering harder beasts. As you tend to your shop you’ll want to sell the most valuable, most interesting loot and make the most money. These systems tie into each other so nicely that it’s hard to tell them apart. The second you improve in one area, you want to see how it affects the other. And on top of that intensely satisfying reward loop, Moonlighter’s two games are intensely fun all by themselves. The dungeon crawling elements take a lot of inspiration from the sort of top-down Zelda games that everyone has played at one point or another. But the developer has layered in its own ideas as well as some inspiration from other games that make the game so immediately moreish. Combat is about precision movement and well-timed attacks, with some interesting enemies that occasionally have unique properties the game forces you to discover for yourself. Take too long on a particular floor of the dungeon and you may discover a strange slimy ghost chasing you away. For fans of Spelunky it’s nothing new, but before chasing you, it’ll destroy any loot in the room you are in, which is much more off-putting. And that isn’t the only way that Moonlight has refreshed loot gathering. Some items are cursed, and those curses have strange effects on the objects. Some might destroy items next to them once you leave the dungeon. Some might transform neighboring objects into something else. Some might have to be placed in a specific part of your inventory. This micromanagement is almost a game within itself and you’ll be balancing monetary valve, personal valve and intrigue in deciding how to pack your rucksack. Then when you take it back to the store you’ve got whole new puzzles to consider. The shop is yours to control, and that means setting the prices. You can charge any amount for anything, but the customers will be the final judges. Moonlighter seemed to suggest that there some kind economic system in place that might change the value of items over time, but in practice I never found this to be true. But the system they do have, of experimenting with different prices, is communicated so well it’s simply a joy to run your little shop. The opening hours of your shop only last a couple minutes and in that time you’ll have to chase off thieves, restock shelves and man the till. Both these aspects of the game work well together, in part because they’re both so adorable. The graphics of Moonlighter are stunning, with incredible detail and animation added to vibrant pixel art. The shop and your many customers are lovely, the quaint town so peaceful and the dungeon so exciting. There are a few little hiccups, like your character’s running animation. While you can move in any direction, the animation has only a few options. It gives the appearance you’re gliding rather than running, but it’s also something I quickly forgot about while playing. There are a few other bugs as well, like text not properly fitting into the screen or button prompts momentarily disappearing, but even these aren’t truly annoying. There’s something inherently charming about Moonlighter, something that can’t be tarnished with a handful of technical or graphical bumps. From its oddly touching story featuring themes of determination and adventure to the satisfyingly simple money hoarding mechanics, this is game whose only missteps are superficial and it’s a delightful title well worth moonlighting to play. Reviewed on PlayStation 4 (code provided by the publisher). You can purchase it for PC via Green Man Gaming and for Xbox One via Microsoft Store.